You can change the order of your accounts in the account select window by tapping and holding on an account icon and dragging it where you want it. To delete an account, tap & hold on an account icon and then drag it to the right until you you see a notice to delete the account. There are two ways to quickly switch accounts in Tweetbot. If you only have a couple accounts, the quickest way is to swipe left over your account icon in the navigation bar. This will quickly switch to the next account. To quickly pick a specific account, just tap & hold down on your account avatar in the navigation bar, and a list of your accounts will appear. Keep holding your finger down while dragging to the account you wish to select and then release. Tweetbot allows you to set the last two tab buttons for quick access to specific sections. Just tap & hold down on one of the last two icons to reveal the menu of other sections. Just like with quick account switching, you can tap, hold, drag, and then release to quickly select another section. 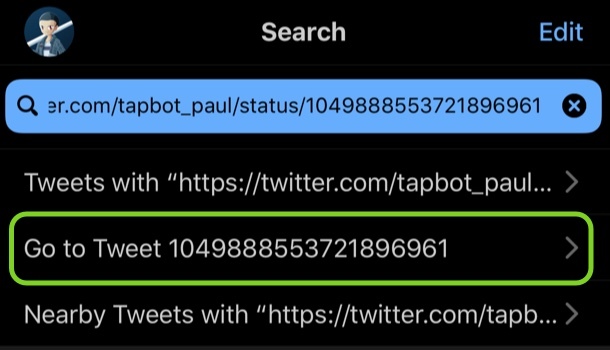 Tapping on a tweet in your timeline reveals all the actions you can perform on that particular tweet, but there are some useful gestures for some of the more common actions. Swipe Left: Swipe left on a tweet to access the tweet‘s details which includes the earlier conversation and replies. Swipe Right: Swipe right on a tweet to reply to a tweet. Short Swipe Right: If you slide a tweet to the right without releasing, you‘ll notice a “like” icon appears first and then a reply icon. If you release the tweet while the “like” icon is shown, it will toggle the “like” action. You can optionally change this short-swipe action to “retweets” in the settings. Timeline filters can be thought of as saved timeline searches, but they can be more powerful than that. You can find the option next to the search bar at the top of any timeline list. This includes your main timeline, list timelines, search results, mentions, and likes. There are default filters you can quickly select like only show media, links, retweets, or quotes in your timeline. But you can also create your own custom filters that you can save for future use. Lists are a powerful way to create custom timelines and separate tweets into digestable topics of interest. Want to follow sports news, but not get spoiled from tweets in your main timeline? Just create a sports list and add sports-related accounts to that list. When you are in the mood to read sports news, you can just access that list. The list tab is where you create and manage your lists. You can also read from your lists there. Lists can be public or private. Once you have your lists created, you can quickly add people to one of them any time from their profile or by holding down on their avatar in a tweet and selecting “Add/Remove from Lists”. 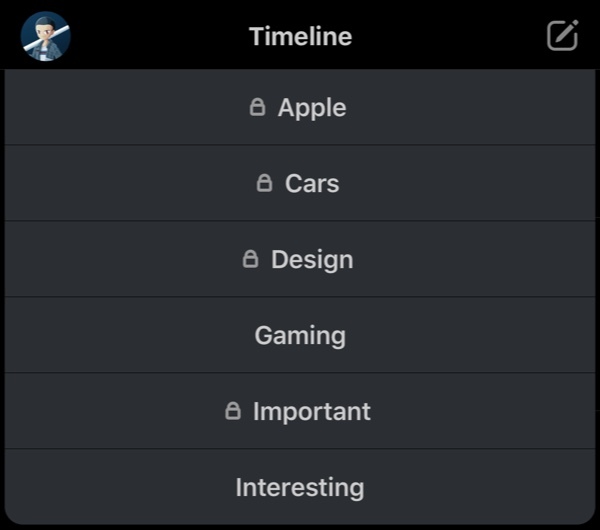 One long time Tweetbot feature is the ability to use any of your lists as your main timeline. To do this, all you have to do is hold down on the “Timeline” label in the navigation bar (in the timeline tab) and a menu populated with your lists will appear. Select one and that will become your current timeline. You can switch to another list or back to your main timeline any time by performing the same action. If you close a tweet you are composing you‘ll have the option to save it as a draft. You can create an unlimited number of drafts. Drafts are accessible from the gear icon in the compose view, but you can also quickly bring up your last draft by holding down on the compose menu icon. If you want to create tweetstorms or chain together multiple tweets as replies, Topics are for you. You can access Topics from the gear icon in the compose view. Hit the add button, enter a title and you can optionally append hashtags automatically at the end of each tweet. Now each tweet you create will automatically be a reply to the previous tweet until you close the Topics header. Ever forget why you followed someone or who they are? Tweetbot allows you to write and save notes on user‘s profiles that are completely private to you. Just go to a user‘s profile and click on the user icon in the navigation bar. Select add note and type away. No one can read these but you. You can quickly switch between the light and dark theme by swiping up or down on the app with two fingers. Ever get a link to a tweet or someone‘s twitter profile and not know how to get there within Tweetbot? Just go to the search tab and paste it search. The option to go to that tweet or profile will pop right up. If you accidentally hit the status bar at the top of your phone and your timeline scrolls to the top unintentionally you can go back to your last read location by hitting the status bar again. This feature is also useful to access timeline search or filters at the top and then return to your last unread location.